Megan at The Scent of Water is this weeks interview. I read a lot, and when I’m not reading, I wish I was. That pretty much sums up the essence of my entire existence. I also have one husband and three children, but I find that if you throw some food and hugs and kisses in their general direction every now and then they pretty much take care of themselves. You are such a talented seamstress, is sewing your favorite craft? If so, how did you get started and what was the first item that you created. Talented is not the word I’d use! Chronically hopeless is closer to my own version of how I sew. Fortunately on a blog I can photograph all the nice bits and no-one can see the rest. I have a love/hate relationship with sewing. I love fabric and the idea of making things out of fabric, but I do get very frustrated that my vision is always exceeding my reach. If not, what is your favorite craft? My most favourite craft is a subset of sewing: quilting. I mostly quilt free form these days, which is a fancy way to say I just pick up pieces of fabric and sew them together in a fairly random fashion. I got started in quilting by looking through quilt books in the library, being thoroughly inspired by their beauty, and then borrowing my mother-in-law’s sewing machine and jumping right in. I have a special love for the combination of beauty and utility and quilts are definitely both of these. 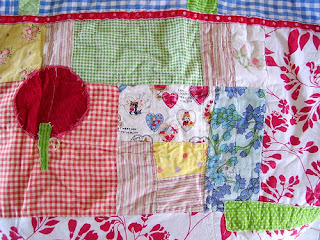 The very first quilt I made was a baby quilt I designed myself. It had 5 huge blocks of Ohio Stars, and 4 plain squares and though I would be unlikely to make something like that now, I loved it. I also gave it away, which has been true of every single quilt I have made since. I have promised myself that the next quilt I make will be for me. So far all I have done is lots of dreaming – it turns out I am a much fussier client than anyone I have ever sewn for before. I’m considering firing myself. Thrift store shopping seems to be something you enjoy, how often do you visit thrift stores,(is that what they are called in Australia) and do you go to the “thrifting” with an intention or do you go just hoping to find some great treasure. I spend far too much money being ‘thrifty’! Yes, I love to visit thrift stores and have a particular favourite just a few minutes up the road from where I live that always seems to have many treasures hidden inside. 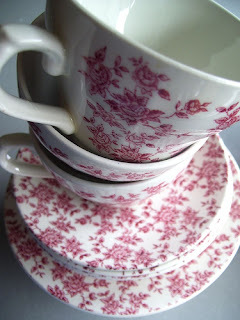 I particularly love old china tea cups and find it very difficult not to buy one at every visit. Thrift stores are called Op Shops (short for opportunity shop) in Australia, but I never get to visit them because I live in New Zealand! Fortunately (or unfortunately depending on your point of view) we share a common idiom, and they’re called Op Shops here too. I do usually say thrift shop on my blog though, because I like the sound of the words better. I’m pretty sure I should have been born French. Visiting your blog is like visiting a friend for tea, it is peaceful, fun and it touches on things that women seem to be interested in. How do you feel about your blog and your visitors. That’s a very kind thing to say; I certainly hope that people visiting my blog feel comfortable. They’re all very welcome. If I could sit down with a cup of tea and slice of cake with every women in the world, from leaders of nations through to the lady who packs my bags at the supermarket, and let them know how much I admire who they are and what they do, I would. I really would. I enjoy my blog a great deal, and miss it when I am on holiday or too busy to give it much time. I have an incessant worry that it is much too confused and unfocused, which greatly bothers me. I have never managed to sort that out satisfactorily. I have, of course, the very best visitors in all of blog land. What I don’t understand is why they keep coming back. I’m hugely grateful that they do, otherwise I would have to be all mateless and sad, and that’s rather too pathetic to think about really. When and why did you start your blog ? How has blogging influenced you at home and with your crafting? I started The Scent of Water in November, 2006. I had another blog before then but it had gotten to the point I felt I was locking myself into a persona that wasn’t very true to the real me, at least not much of the time; I was also burned out with university study. After my final exams I got all antsy for another blog and The Scent of Water was born. The reason I started to blog again was because I just loved having an outlet where I could rave on about whatever happened to enter my pretty little head at the time and nobody would look at me funny or ask me to shut up. Which is also the biggest influence having a blog has had on me: it gives me the freedom to say out loud and often, my god, isn’t life a miracle? Because isn’t it? Takes my breath away, this planet we live on. I understand that it is also full of war and famine and disease, all of which are most definitely not amazing, and I would never downplay the struggle that just getting through a day can sometimes be. Indeed, it’s precisely because of the struggle that I think life is beautiful and worth the fight. We’d just take it all for granted otherwise. My crafting has mostly been influenced by other people’s blogs. It would have taken me a long time to refine my own sense of style without meeting so many different artists and craftswomen and being exposed to what they have done and are currently doing. I’m enormously grateful for this. Do you feel obligated to blog on a regular basis? Do you have a specific time that you set aside for your blog? I don’t feel obligated to blog every day but if I go a few days in a row without a post I start getting that nagging feeling in my head. I’m much better about this than I used to be though – I like to think my blog friends are patient enough that they won’t abandon me if I go through a dry period every now and then. I’m much too busy these days to get away with this (I started graduate studies this month), fun though it was while it lasted. Mandy of www.treefalldesign.typepad.com once mentioned that she blogs in the evenings, and I have been thinking for a while that I might have to do the same to save my day being swallowed whole. As long as it doesn’t interfere with my television watching. Priorities and all that. I love the name of your blog, How did you come up with it. I was looking through the books on my shelf for inspiration and came across it in the Old Testament’s Book of Job. The whole phrase is: “At least there is hope for a tree: If it is cut down, it will sprout again, and its new shoots will not fail. It’s roots may grow old in the ground and its stump die in the soil, yet at the scent of water it will bud and put forth shoots like a plant.” I felt rather useless and dried up myself at the time and this really spoke to me; I loved the poetry, the imagery, and the metaphor of old things being made new. I do try, when I remember at least, to make my blog a place where people can find some small bit of refreshment and encouragement, myself included. Whether I ever succeed in this aim, I’ll let you all judge. What are the top three blogs that you visit regularly? That’s a very difficult question! I have many, many, blogs that I love to visit regularly, though I comment much less than I used to. It gets a bit too much to keep up with it all after a while doesn’t it? I really must add that I have been very, very, blessed with meeting a whole bunch of amazing women through blogging that I am privileged to call friend (you know who you are!) It’s a pretty awesome community we have. I’m getting all soppy now. 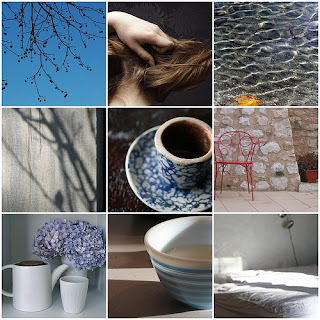 The photos on your blog always make me smile, I really like the mosaics, when did you become interested in photography and how has that interest grown. I’ve loved photography since I was a little girl. I still have photos I took of my cousin ‘modelling’ for me when I was somewhere around 11 years, she 10. They’re awful. I was awful for a long, long, time. I still have a rather limited range of photographic ability (not to mention primitive equipment! ), but I do think I have developed a certain clean and simple aesthetic that I enjoy. I’d really like to take some classes and get some better equipment in the future so that I can develop my knowledge and ability. Unfortunately I’m just too lazy to do anything much about it. True story. Do you have anything exciting planned for Valentines day? Any great gift ideas that we can steal??? You know, I’m a real bore when it comes to stuff like that. I’m the kind of person who is invariably in bed come midnight on New Year’s Eve, and I have to absolutely force myself to do the children’s birthday party thing so I am not eternally condemned as the Worst Mother Ever. But still, I do love a pretty cupcake and I was planning to make jaw droppingly delicious raspberry coconut cakes with a candy heart on top for dessert on Valentine’s Day. Not very exciting, is it? If you want some great ideas to steal try a visit to Jennifer The Theme Queen at The Felt mouseShe has posted some excellent Valentines ideas and links. Megan, I love visiting The Scent of Water, it just has such a peaceful and real feeling. Thank you so much for your time and agreeing to be interviewed. It was my pleasure entirely. As for the blog being confused or unfocused... might be true - and might also be the reason I love Megan's blog for and find so touching what she writes: It's her. Thinking, trying, searching. This was fun to read. Megan sounds a lot like me! I guess that's why I read her blog. What a fun interview. The Scent of Water is one of the blogs that has inspired my new blog. I like the feeling of serenity I get when I visit Megan's blog (even when she's not talking about things that are serene) and wanted to have a little space like that of my own. I just love these interviews...it's nice to hear about the realness behind the blog. That was fascinating - thank you for such perceptive questions. I'd loved reading about where the name the scent of water came from.